When I talk about After Care I am talking about the things you do outside the treatment room. I can only do so much on the treatment table, so you need to make sure you are aware of your body outside of the treatment room if needed. The reality is that majority of us have very repetitive jobs completing the same tasks day in day out using the same muscles all the time. If you are then only getting a treatment once a month for example that quite isn’t out weighing the overuse of your muscles/bodies. What does After Care involve? After care involves any self-care treatments such as massage ball work, foam rolling, stretching, strengthening and then just in general being aware of your posture and manual handling techniques day in day out. A combination of all of these are so important outside the treatment room to ensure your body is kept in working order. The Foam roller works more broadly over the muscles. It helps bring better blood flow to the muscles and improve mobility. This is a great tool to use to help loosen up your muscles before you start a work out or at the end of the day but can also be used for stretching. This can replicate a deep tissue massage (obviously nothing beats a real deep tissue massage). 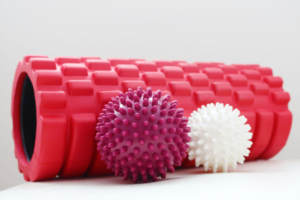 If you are going to use both the foam roller and massage ball, I would suggest using the foam roller first followed by the massage ball. The massage ball helps reduce tension and improve blood flow by targeting the trigger points (knots) in the muscles. The massage ball works more specific on the muscles by targeting trigger points. By targeting the trigger points with the massage ball as well as in the treatment room, it will help reduce the referred pain dramatically. A great tool to take anywhere in your bag. 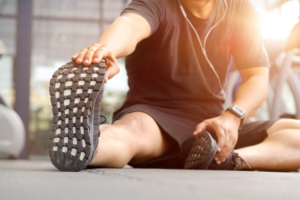 Stretching is great to increase the muscles elasticity and overall improving your ROM. When you have restricted ROM through the joint it can cause the muscle to be tight and then leading you to be in pain. Including some sort of stretching routine into your life will only benefit you long term and you won’t be one of those older adults struggling to move around. Whether we have more of a sedentary job, or we like to keep active our muscles need to be strong. Now I am not talking about go do a bench press. I am talking about those smaller muscles everyone forgets about, they are important too. Sometimes we might find one side is stronger than the other so we need to balance our body back up by building strength. Having some kind of strength through our muscles will help with our posture and overall keep our body more mobile. As you can see I believe having all four of these components as part of your routine is vitally important in having a fully functional body. I hear this a lot, we have time for things that we make a priority in our lives. We make time for things we value the most. So if you don’t value your health and wellbeing of course you won’t have time as you won’t make time. Sorry for being harsh but it is the truth. Make yourself a priority and everything else will fall into place. So from this I am creating an online portal exclusive to all my clients. My clients will have access to this online portal where they can login as they please and have access to plenty of videos teaching them how to use a foam roller, a massage ball, a variety of stretches and strengthening exercises. This will enable my clients to have a better understanding on after care and allow themselves time to look after their body not just in the treatment room. SO IF YOU ARE A CLIENT OF MINE GET EXCITED!! !